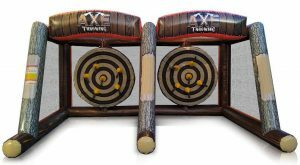 Description: With this new velcro Axe Throwing game, you can test your accuracy as you aim for the inflatable target ahead. Play alone, or grab a friend and take your best shot! Electrical Req. : 1 x 20amp line of 110volts within 100ft.